Harbor Walk Village, Destin, FL: Harbor Walk Village was designed by 2 WR Holmes Wilkins and constructed by Moss-Anderson Joint Venture. 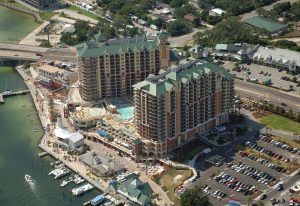 Located in Destin, Florida, it consists of two 18-story buildings constructed over a parking garage. Kemco Inc. was responsible for the installation of below grade waterproofing, deck coating, concrete floor sealer, interior and exterior expansion joint system and joint sealants at windows and stucco. Vista Del Mar, Pensacola, Florida: Below grade waterproofing was installed at all elevator pits and below grade structural foundation walls including the elevated pool. All balconies were coated with an ultra-violent resistant deck coating. Caulking was installed at exterior of building joints to create a water proof facade.